Earlier this week, I crossed off one holiday task from my to-do list: ordering the holiday cards. Since we do an annual photo card of our daughters, I first had to figure out their outfits, take pictures of them on a cold morning, then choose and order a card design. I'm tired already and in a few weeks when the cards arrive, I'll have to handwrite a short personal greeting on each, address all the envelopes and send them! You probably know the drill. Why keep doing it then? Friends and family seem to enjoy receiving pictures of the girls, for one. My bigger motivation is that I plan to put together a small album for the girls with copies of each year's card—a "sisters through the years" kind of thing. They are best friends, and it will make a nice gift someday. As writers, we can also use our skills to keep in touch with people during this time of year. Some do an annual letter with family news, and of course a personal letter is always welcome. In Simplify Your Christmas: 100 Ways to Reduce the Stress and Recapture the Joy of the Holidays, Elaine St. James provides another suggestion: Have your family come up with a name or two or half a dozen of the people who have positively influenced your life, then send them a card or a note letting them know how much you appreciate their contribution. * Collect interesting and colorful postcards from your travels throughout the year, then send them off during the holidays with a personal message and an interesting anecdote from your trip. * Respond to incoming holidays cards as they come in, so that you’re completing a little bit at a time. Each day, send a reply card to one person with a brief personal message. * Respond to the cards you receive—but not at Christmas. Starting in the new year, each week at your leisure send a couple of hand-written personal notes in response to the holiday greetings you've received. 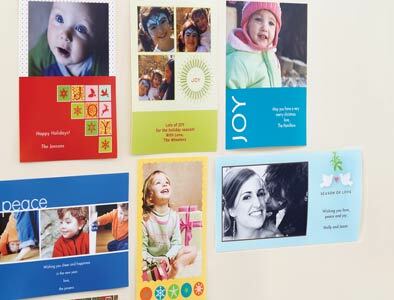 Do you send holiday cards every year? Feel free to share any tips you may have.